Most surfaces are unseen breeding grounds for bacteria, that can multiply at an alarming rate. 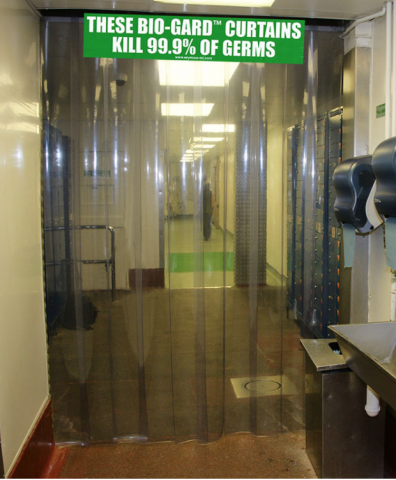 Before you know it, these germs are everywhere – Bio Gard Curtains have been designed to stop that spread. Perfect for medical environments, clean rooms, pharmaceutical cold rooms and high risk areas. • Bio Gard is proven to stop the spread of 99.99% of all germs, and kill them dead. • Independently tested to JIS Z 2801, 2000, ISO 22196, 2007 and EU Directive 20002/72EC, world standards. • Proven to kill notorious strains such as MRSA, E.coli, Salmonella, Listeria and Legionnaire’s Disease. • Can be tailor-made to fit any size of doorway.